The building you see above is the third on the spot; the two previous ones had burned down. Philip Astley started his circus business in 1768 as just an open-air temporary set-up in St. George’s Fields, on a stretch of land called Glover’s Halfpenny Hatch. The enclosure doubled up as a riding school and an entertainment venue. A few years later, Astley secured a plot closer to Westminster Bridge where he built a more permanent structure, which was roofed over in 1778-9. It was refurbished in 1786 and renamed “Astley’s Royal Grove”. 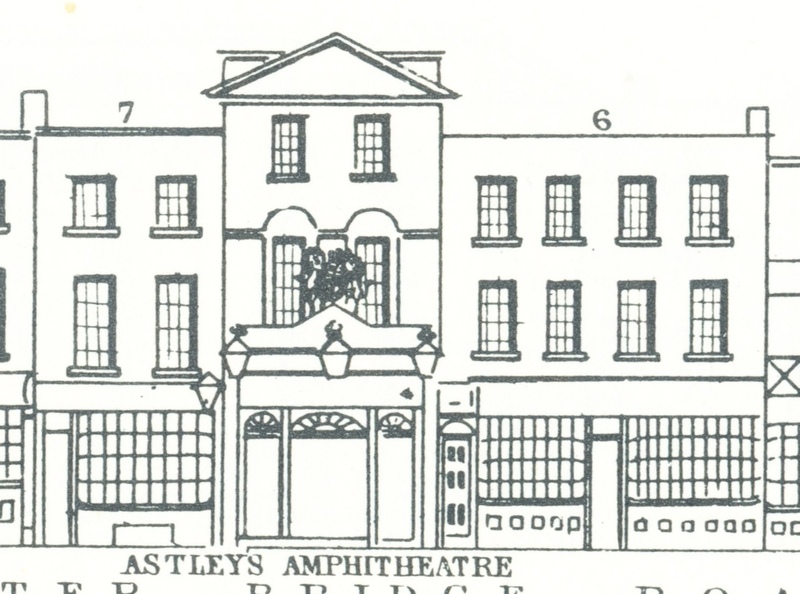 It burned down and was subsequently rebuilt in 1794 and renamed “Astley’s New Amphitheatre of the Arts”. In 1803, the amphitheatre burnt down once again, but was just as quickly rebuilt and that is the building you see above. 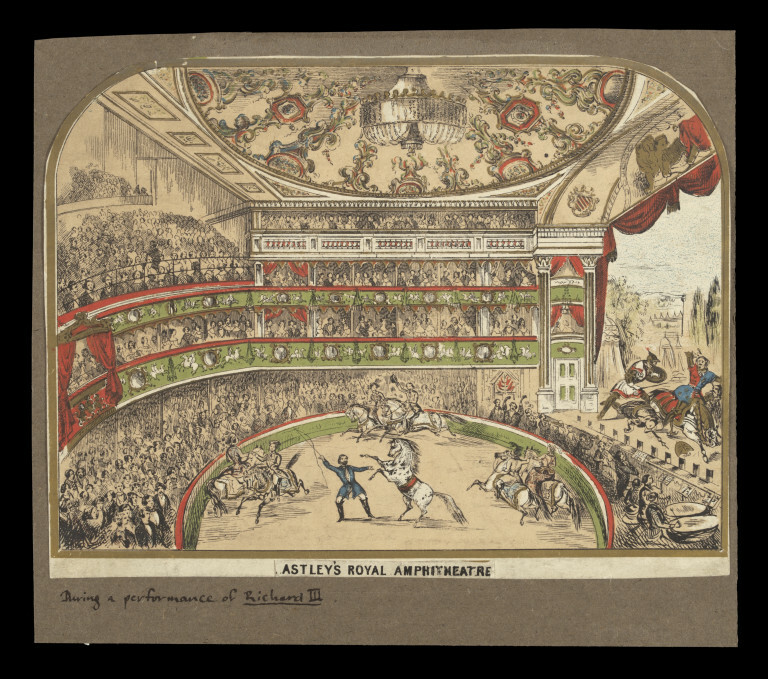 We would now consider Astley’s entertainment a combination of theatre and circus. He started out with horse shows, but very soon all sorts of theatrical performances were added. 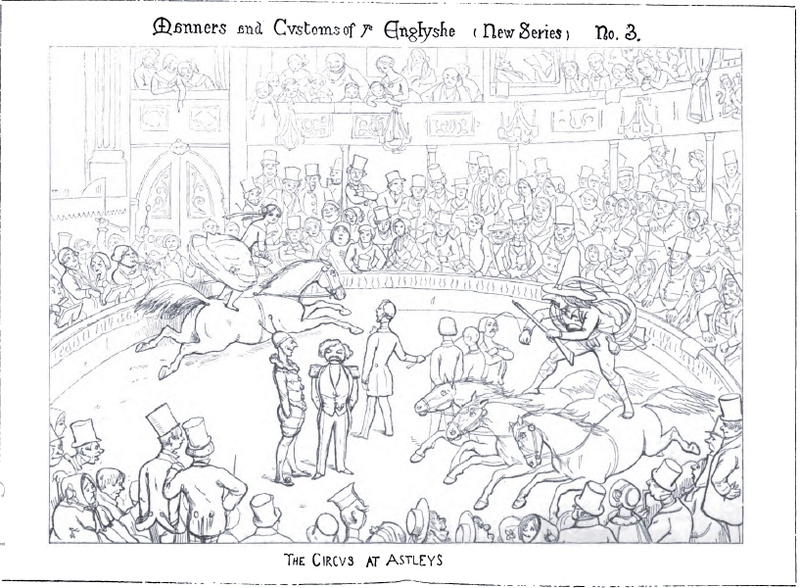 As you can see in some of the illustrations below, the building contained both a circus area in the middle and a theatre stage on one side. The entertainment was at first mainly provided by Astley himself and consisted of showing his horsemanship assisted by a clown and some music. According to Peter Cunningham in his Handbook of London. Past and Present (1850) “transparent fireworks, slack-rope vaulting, Egyptian pyramids, tricks on chairs, tumbling, &c., were subsequently added, the ride enlarged, and the house opened in the evening”. 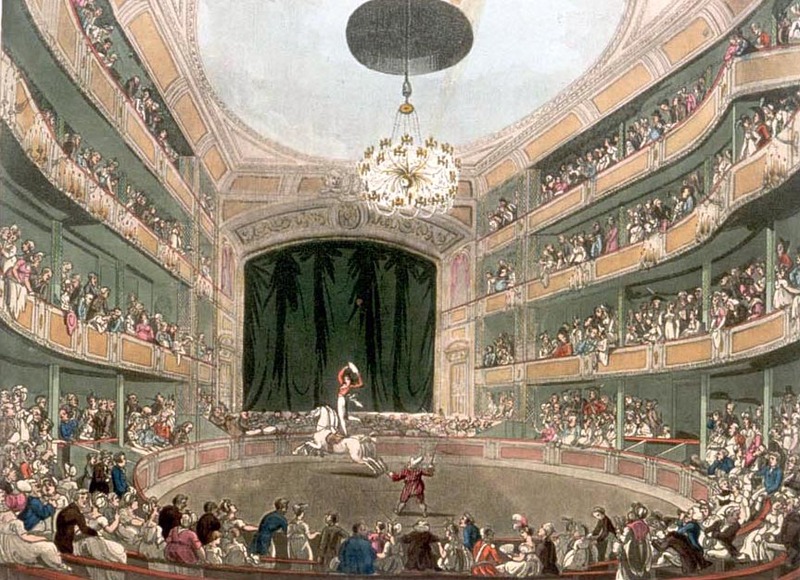 In 1824, The Memoirs of J. Decastro, Comedian were published which contained “an analysis of the life of the late Philip Astley, Esq.” Jacob Decastro had switched in 1786 from Astley’s competitor “The Royal Circus”, run by Charles Dibdin, to Astley’s where he was engaged as performer in various burlesques, musical farces, and pantomimes. Decastro was in an excellent position to note down particulars of Astley’s life and the Memoirs are full of details about Astley. We draw upon it for the following, supplemented by information from the Circopedia and the ODNB. 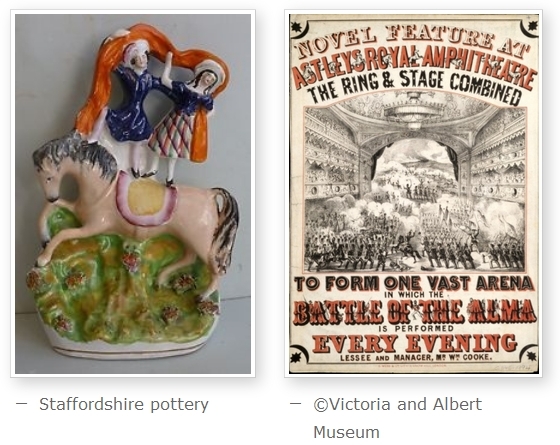 (1) Astley was born in 1742 in Newcastle-under-Lyne as the son of a veneer cutter and cabinet maker. Astley quarrelled with his father and left the family business to enlist in General George Augustus Elliott’s Light Horse Brigade which was based in Coventry. Astley served in the Seven Years War and became an able soldier, but an even better horseman. He had ample opportunity to work with horses in the regiment’s riding school and he decided to make teaching and breaking horses his profession. He obtained his discharge from the regiment and as a reward for past services he was given a “Spanish Horse”. Here Decastro inserts a footnote of how wonderful a performer the horse became, allegedly being able to take off his own sadle, fetch the tea service and take the kettle of boiling water from the fire, acting “in fact after the manner of a waiter at a tavern or tea garden”. I leave it to your own credulity whether you believe this or not. 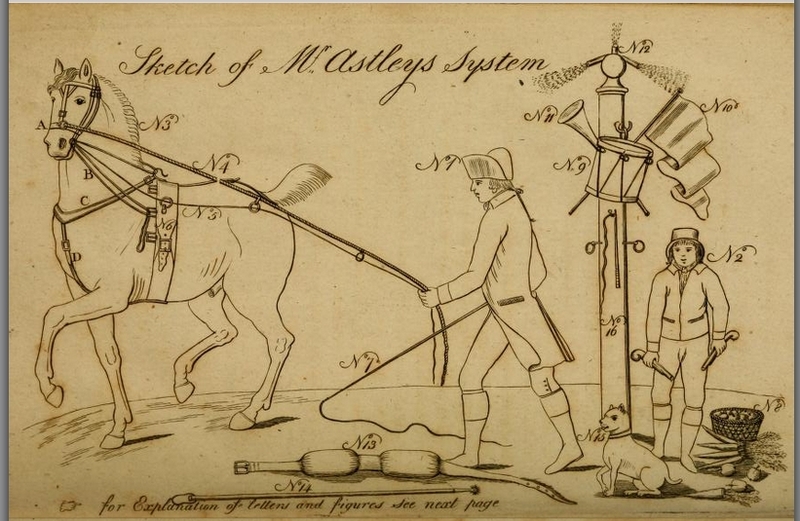 In Astley’s System of Equestrian Education, published in 1801, it is explained how horses can be trained, and also what to feed them, how to groom them, and how to treat diseases. 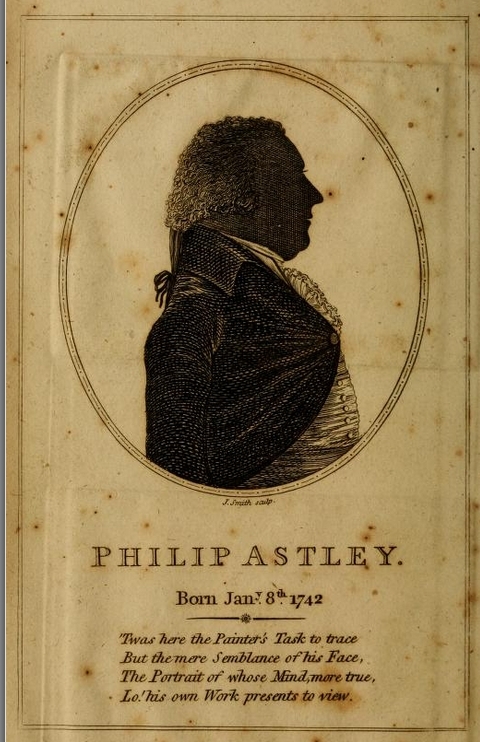 At the end of the text the author styles himself “Philip Astley, professor of the Art of Riding” and explains that he has retired from his Westminster Bridge and Dublin establishments in favour of his son John Philip Conway Astley, but he could still be found at the Paris Amphitheatre. It is in Paris that he died on 20 October 1814. He was buried at the Père Lachaise cemetery. His son survived him by only seven years and the theatre was taken over by Andrew Ducrow, one of the riders and later manager of the theatre. Ducrow was born in 1793 and was trained to handle horses by his father who was originally from Belgium and a ‘strong man’, able to lift a table with four or five children on it with his teeth. He performed at Astley’s and was nicknamed the “Flemish Hercules”. Ducrow married twice; in 1818 to Margaret Griffith who died in 1836, and in June 1838 to Louisa Woolford (c.1814–1900), a popular equestrian performer. They had two sons and a daughter, none of whom went into the circus. 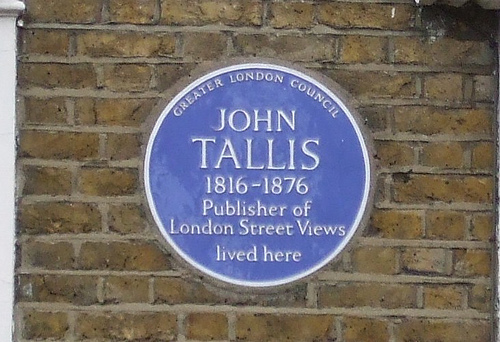 (2) In 1841, after the publication of Tallis’s Street View, disaster struck once again with yet another fire. This setback was such a blow to Ducrow that he suffered a severe mental breakdown, dying six months later, on 27 January, 1842. 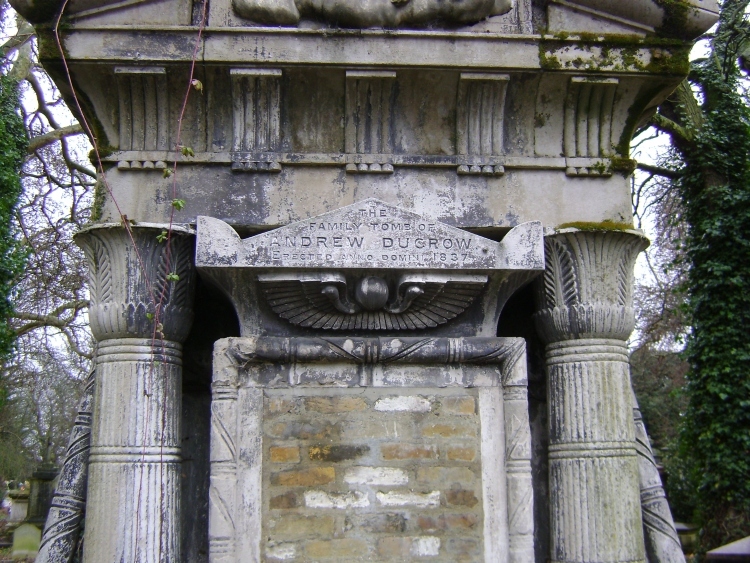 Ducrow was buried at Kensal Green Cemetery in a tomb designed by the theatrical designer of the circus company, Danson. It was originally painted in pastel colours, but these have faded over time. 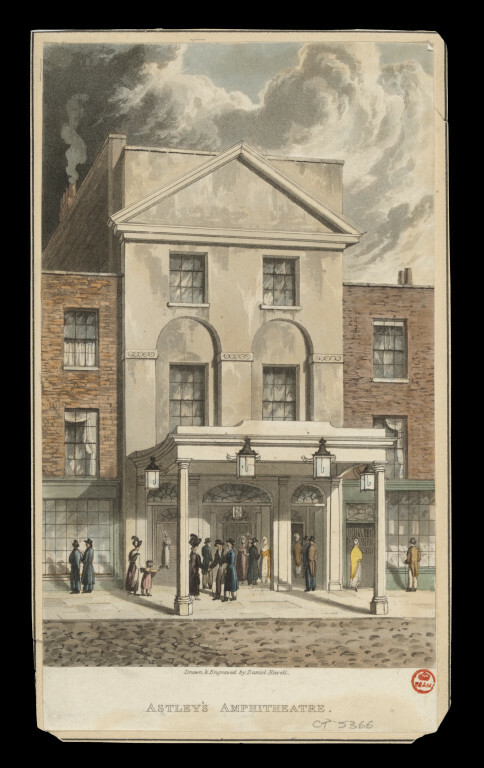 (3) The amphitheatre rose from the ashes of this last fire once again under the management of William Batty who handed over in 1853 to William Cooke who was to run the business until 1860. It was finally demolished in 1893. See for a handbill of Astley’s Riding School the excellent blog post by the Georgian Gentleman on 18th century handbills (Astley’s is the bottom one) and for more information on Philip Astley himself the post: 20th October 1814 – the death of a great showman. And if you want to know even more, why not buy Astley’s Circus, the Story of an English Hussar by Mike Rendell? See the blog post on the book by the Georgian Gentleman here. (1) Marius Kwint, ‘Astley, Philip (1742–1814)’, Oxford Dictionary of National Biography, Oxford University Press, 2004; online edn, Jan 2008. (2) Laurence Senelick, ‘Ducrow, Andrew (1793–1842)’, Oxford Dictionary of National Biography, Oxford University Press, 2004; online edn, Jan 2008. (3) See for other pictures of the tomb and a portrait here. (4) C. Dickens, Sketches by Boz, new edition, 1839, pp. 64-67.